Abu Dhabi, 23 February 2018 – مرحباً (Marhaban!) 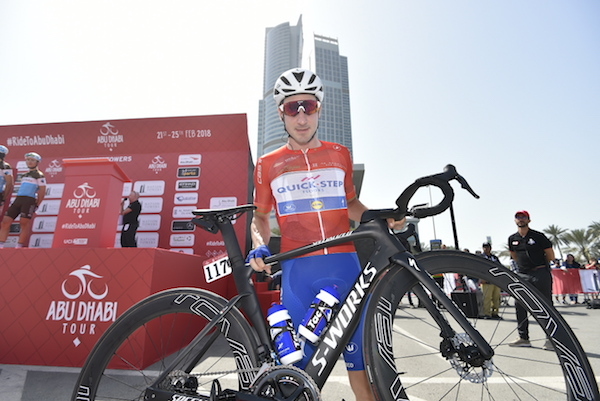 from Stage 3, Nation Towers Stage, of the fourth edition of the Abu Dhabi Tour (21 - 25 February 2018), the only WorldTour race in the Middle East and organised by the Abu Dhabi Sports Council in partnership with RCS Sports and Events. From Abu Dhabi to Abu Dhabi (Al Marina - 133km), the stage runs in the city, deviating only to take in the famous Al Wathba Camel Track, from Nation Towers, home of the Abu Dhabi Tour official Fan Zone, to Al Marina, with the finish line close to the Big Flag. The last ideal stage for the fastest wheels in the peloton, may end up with a bunch sprint. During the stage, 36 Green Jersey Points (of a race total of 92 remaining), 16 Black Jersey Points (of a race total of 32 remaining), and 16 seconds in time bonuses are up for grabs. The ceremonial roll out started on schedule at 13:35, After crossing the 2,000m neutralised zone, the peloton of 136 riders passed km 0 at 13:38. Did not start number 22 - Pello Bilbao Lopez De Armentia (Astana Pro Team). Stage 3's route is mostly within the city. After the start, wide roads head towards the Grand Mosque where the course diverts towards the Al Wathba Camel Track, site of the first intermediate sprint. 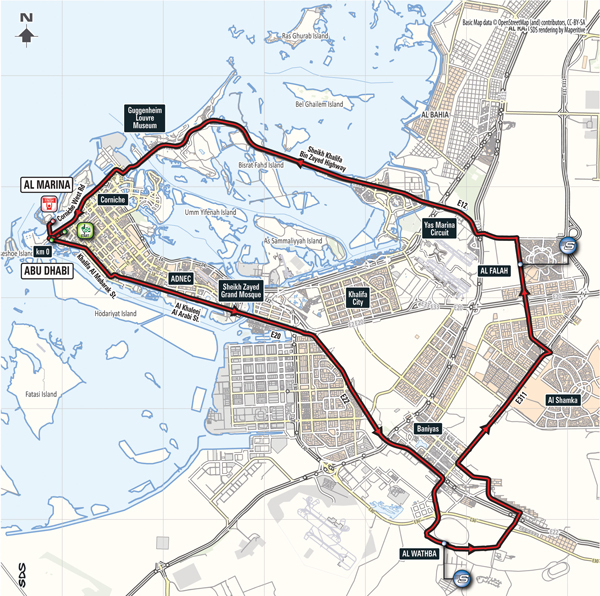 It then leads back to Yas Island through Al Falah, where the riders find the second intermediate sprint - note there are also several roundabouts and speed bumps in this area. 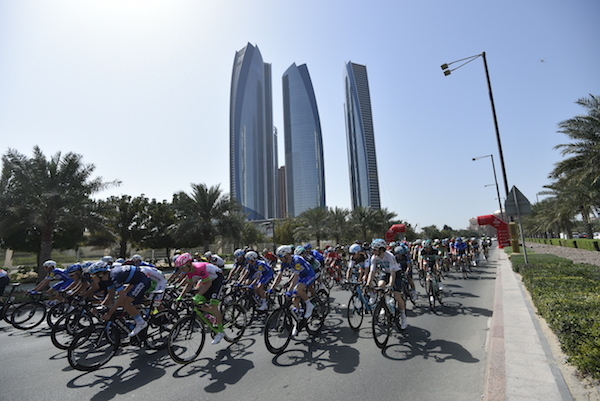 After Yas Island the race continues on Sheikh bin Zayed Highway, along the Abu Dhabi Corniche and towards the finish. The whole course is on wide roads but again riders must be aware of the cat's eyes. The last 5km are all on a wide road with broader bends leading to the flat, asphalted finish line. Nation Towers is a luxury complex comprising two towers that have world class facilities including The St.Regis Abu Dhabi hotel, loft apartments, office space, retail, cinemas, recreational amenities, a beach club and ample parking for residents and visitors. In the vibrant heart of Abu Dhabi, the St. Regis Abu Dhabi is the finest address in the city, each of its 283 rooms having a magnificent view of the alluring Abu Dhabi Corniche. The Abu Dhabi Suite, high on the skybridge between the two Nation Towers has an astonishing 360 degrees view. The signature St. Regis Butler Service is complimentary for every room in the hotel. Remede Spa in Abu Dhabi creates a sanctuary for guest and an experience which borders on mystical. A real iconic Abu Dhabi landmark, this luxurious hotel blends Arabian splendour with the latest technology to create a magical and memorable experience. During daytime, the hotel’s golden-sandy colour contrasts with its fresh green gardens, silvery water fountains and the blue sky. At night, the hotel’s lighting changes subtly, featuring a majestic rainbow-changing effect over the main dome. The new Abu Dhabi Presidential Palace, on the Ras Al Akhdar peninsula next to Emirates Palace Hotel, will house the offices of H.H. The President, H.H. The Vice President, H.H. The Crown Prince and top state ministers and officials. With its site of approximately 150 hectares, the palace will serve an important role as the primary governmental facility for receiving and hosting visiting dignitaries. The Abu Dhabi National Exhibitions Center is the largest exhibitions center in the Middle East with a total space of 133,000 square meters. It was opened by Sheikh Khalifa bin Zayed bin Sultan Al Nahyan, President of the United Arab Emirates in 2007, and last summer hosted the very first Abu Dhabi Sports Festival organized by the Abu Dhabi Sports Council (ADSC). This giant sports complex is home to everything from basketball and beach volleyball facilities to tennis courts, a football stadium and a fitness center. It also has a bowling alley and an ice rink open to visitors. The ZSC’s International Tennis Center-with six training courts and a center court with a spectator capacity of 5,000- hosts the annual Mubadala World Tennis Championship. Wahat Al Karama is a permanent tribute to UAE’s brave soldiers and other Emiratis who made the ultimate sacrifice while serving the Nation. It is a place where citizens, residents and visitors to the UAE can pay homage to those who selflessly gave their life to a cause greater than themselves. The Memorial itself comprises 31 massive aluminium-clad tablets, each leaning on the other, symbolising the unity, solidarity and mutual support that bind together leadership and citizens with the servicemen and women who protect them. This architectural work of art is one the world’s largest mosques, with a capacity for an astonishing 40,000 worshippers. It features gold gilded chandeliers and the world's largest hand knotted carpet. The mosque's first ceremony was the funeral of its namesake, Sheikh Zayed, who is buried at the site. Reflective pools surround the mosque, amplifying its beauty. The striking white and gold colours shining in the sun are transformed at night by a unique lightning system which reflects the phases of the moon. Masdar is the Emirate’s pioneering vision of a city of the future, with the goal of becoming the world’s most sustainable eco-city, designed to dramatically reduce energy, water and waste. The city combines ancient Arabic architectural techniques with modern technology and is built around a huge central Arabic wind tunnel that channels a cooling breeze through the streets and alleys making it comfortable to stroll around even during the high summer temperatures. Etihad Airways has its head office and training center in Khalifa City, near Abu Dhabi International Airport. Set in landscaped gardens along a stretch of white sandy beach, this five-star hotel is on the Al Raha Corniche. It has rooms and suites including a brand new, luxurious furnished wing. There are also 24 exclusive, seafront villas which have a choice of 2,3 or 4 bedrooms, adjacent to the main hotel. At the heart of the Saadiyat Cultural District, this is the UAE’s national museum that will narrate the story of the unification of the United Arab Emirates, the history of the region, its cultural connections across the world, and the achievements of the late Sheikh Zayed bin Sultan Al Nahyan. Designed by internationally renowned architect Frank Gehry, this museum will be a preeminent platform for global contemporary art and culture, presenting the most important artistic achievements of our time. Set in the heart of Abu Dhabi’s cultural district, Manarat Al Saadiyat is a purpose-built art space for everyone to be inspired and explore a diverse range of artistic expressions through discovering exhibitions, exchanging ideas, enjoying delectable food, attending a talk or enjoying a movie. Manarat Al Saadiyat includes three galleries dedicated to temporary art exhibitions and a fourth space which houses an all-new Art Studio. It also features a central events space, a Photography Studio, an atrium, a 250-seat Auditorium, a garden area, an outdoor terrace area and the fabulous Larte restaurant. Just seven minutes from downtown Abu Dhabi and 20 minutes from Abu Dhabi International Airport, Saadiyat Island is undergoing a remarkable transformation into a world class leisure, residential, business and cultural hub of global proportions to include the Zayed National Museum, Louvre Abu Dhabi and Guggenheim Abu Dhabi - all designed by Pritzker prize winning architects. Manarat Al Saadiyat (in Arabic literally means ‘a place of enlightenment’) is a 15,4000 square meters arts and culture center, designed to bring the vision of the island to life through The Saadiyat Story. The venue also features four gallery spaces. Moved piece by piece from Shanghai, where it welcomed almost two million visitors to the UAE’s national exhibition during the World Expo 2010, the UAE Pavilion is emerging as a new landmark exhibition and events venue. Saadiyat Beach Golf Club is the region’s first ocean course; the Gary Player-designed masterpiece respectfully harnesses the natural beauty of Saadiyat Island’s magnificent, white sand beaches for a truly unique playing experience. With two five star properties already opened - The St. Regis Saadiyat Island Resort, Abu Dhabi and Park Hyatt Abu Dhabi - and more in the pipeline, the island’s leisure and hospitality offering is rapidly increasing. Set on the island’s serene natural shores, the 400-metre Saadiyat Public Beach is a great spot for a day out, and the perfect place to enjoy Abu Dhabi’s clean, warm turquoise waters. NYU Abu Dhabi is a research university with a fully integrated liberal arts and science college in the Marina district of Saadiyat Island. It draws students from around the world, and prepares them for the challenges and opportunities of our interconnected world. Born of an agreement between the governments of Abu Dhabi and France, the Louvre Abu Dhabi houses the aesthetic expressions of different civilisations and cultures, from the most ancient to the most contemporary. This lengthy stretch of beach extends along Corniche Road from near the Hilton Hotel to beyond Al Khaleej Al Arabi Street, where you’ll find its main entrance. Abu Dhabi’s pristine Corniche beachfront has been awarded coveted Blue Flag status - the internationally renowned eco-label for beaches and marinas that guarantees clean and safe bathing water. Some 30,000 to 50,000 visitors flock to the Corniche every month, enjoying three separate sections for families, singles and the general public. This contemporary revival of a historic district within the heart of the city – the old Central Market, which was the business and trading hub - is now a fully integrated, mixed-use development with a mall, a modern souk, offices and residences. The souk has everything from traditional artifacts, henna and spices to jewellery, Arabic perfumes, clothing and accessories. The Mall brings a selection of unique brands and casual dining options. The ADNOC HQ is hosted in a skyscraper on the Abu Dhabi Corniche that incorporates energy efficiency and sustainable engineering technologies, such as a double skin façade, photovoltaic glazing and LED exterior lighting. Designed by HOK, the overall building complex consists of more than 65 floors with an office tower, Corniche Club, SPC and Crisis Management Center, a heritage museum and other supporting facilities. This five tower complex – comprising three residential towers and the 280m high, five-star Jumeirah at Etihad Towers Hotel – invites residents and visitors to live, work, stay, shop and dine in one destination with panoramic city and Arabian Gulf views. This mall features a 100 metre high viewing platform, an ice rink, a bowling alley, a Cineplex, musical fountains and hundreds of big name brands and stores. A true Abu Dhabi landmark, Marina Mall's many restaurants and coffee shops make it possible to spend a full day here. A 122m pennon (Guinness World Record in 2001) holds an imposing flag of impressive size (20mx40m). It was inaugurated to celebrate the country’s 30th anniversary.